Freyja | Take Back Halloween! Poor Freyja! More than any other goddess, she’s been subjected to the strippers-with-swords treatment in contemporary art. But those deformed creatures with giant implants and chainmail bikinis bear little resemblance to the great Freyja, Lady of the Vanir, chief goddess of the Norse pantheon. Freyja is certainly very beautiful—she is, among other things, the goddess of love—but she’s not naked. She wears a fine gown, the magical necklace Brisingamen, and a cloak of falcon feathers that enables her to shapeshift. She’s also a goddess of warriors, and dons helmet and armor for her forays onto the battlefield. (She gets to choose half the slain for her afterlife world of Fólkvangr, while Odin picks the other half to go live with him in Valhalla.) Amber and gold are sacred to her, and all the wild things of nature are her domain. Her preferred mode of travel is in a chariot drawn by two cats, though she occasionally rides through the air on a golden-bristled boar. 1. 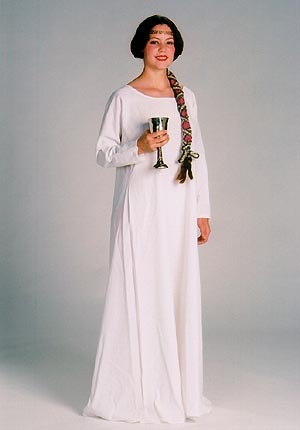 Simple medieval chemise. This is for your base layer. You could also just wear a long sleeved white top from your closet and a white maxi skirt, since your mid-section will be completely covered up by the apron dress (#2). You’ll have some kelly green ribbon left over from trimming your apron dress; use it to trim the cuffs of your chemise or top. You can attach it with Res-Q tape. 2. 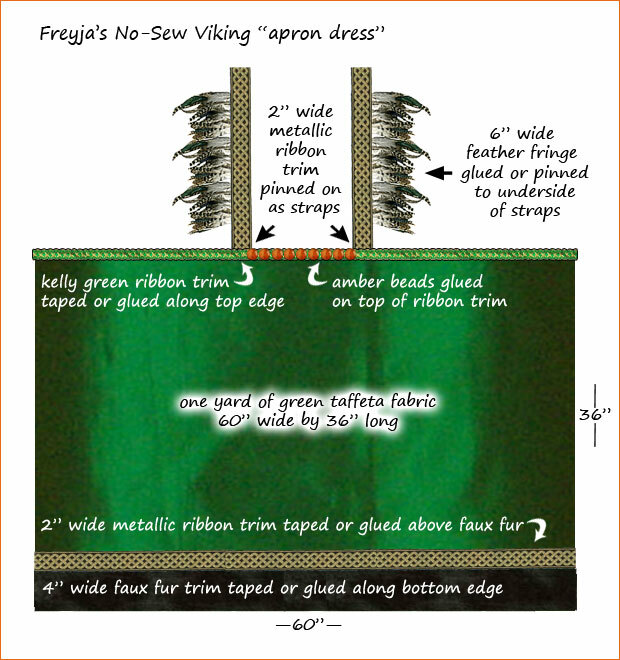 No-sew Viking “apron dress.” This goes on top of your chemise. It’s nothing more than a yard of fabric wrapped around you like a bath towel, with the straps pinned on. The corset-style breastplate (#3) is what’s going to hold it all together and give you shape, so you don’t have to sew anything. 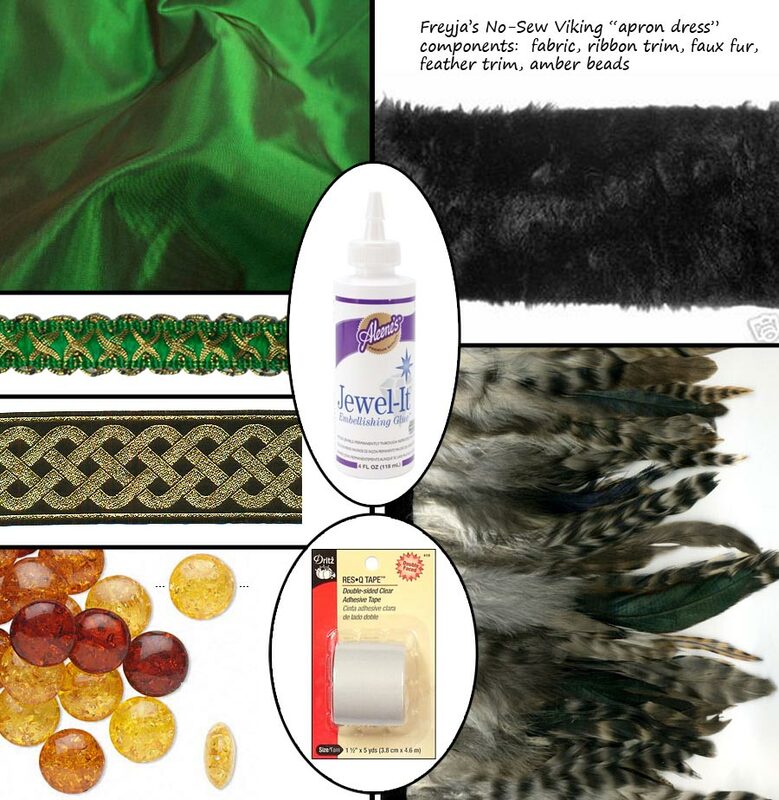 We give you instructions below and a diagram on how to decorate your yard of fabric with faux fur, ribbon, feathers, and amber beads. 3. Breastplate. 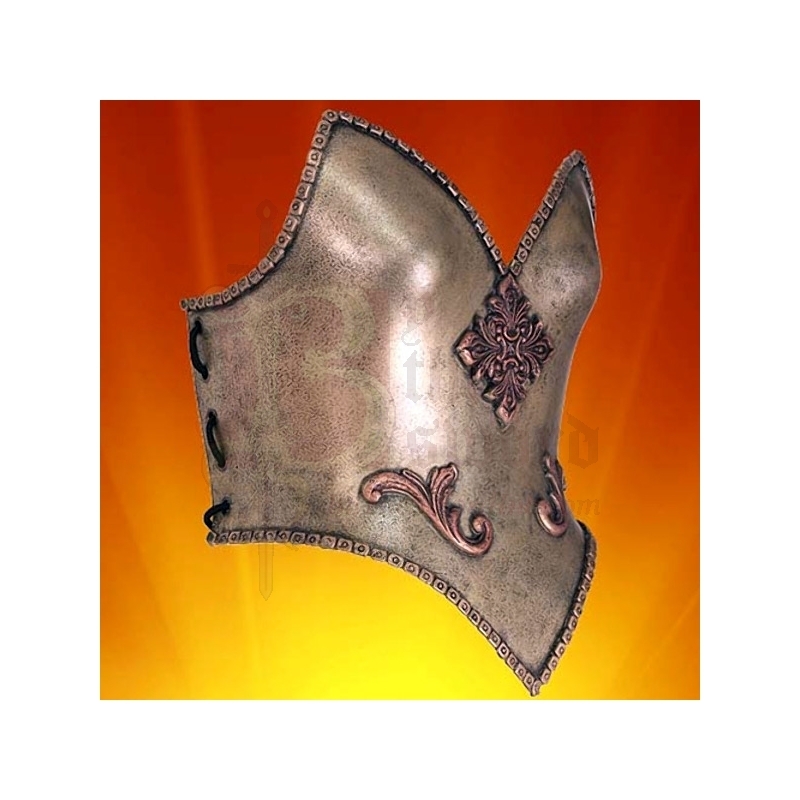 This corset-style breastplate is wonderful but expensive: 90 bucks. However, don’t despair if this is out of your price range! You can make your own with a longline bra and some metallic spray paint. Seriously, this works. Buy a plain longline bra or recycle an old one, and cover the whole thing in a coat or two of metallic spray paint like Rust-Oleum Aged Brass . 4. 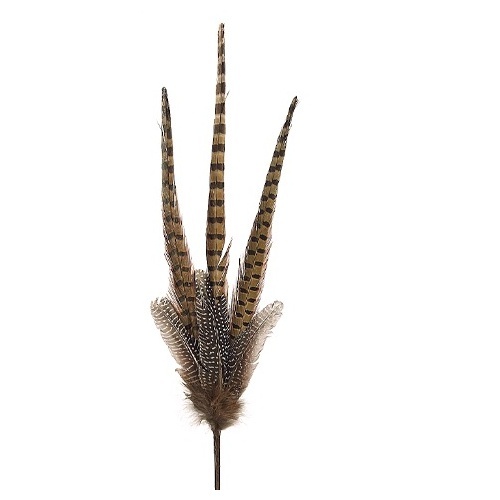 Three sprays of artificial pheasant feathers. Tape these inside your breastplate/corset so that they fan out below like a skirt. 5. Valkyrie helmet. 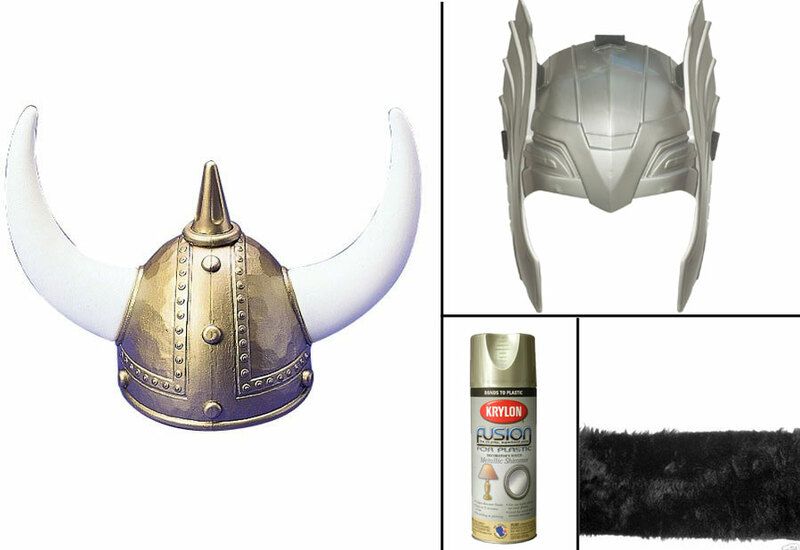 We started with an adult viking helmet —which comes disassembled—and left the horns off. We added the wings from a child size Thor helmet that had been painted with a coat of Krylon Fusion Blonde Shimmer . Then we wrapped some black faux fur trim around it (left over from trimming the apron dress—see below) for a fabulous fantasy Viking look. An alternate choice is this beautiful but expensive metal winged helmet from the Village Hat Shop. 6. 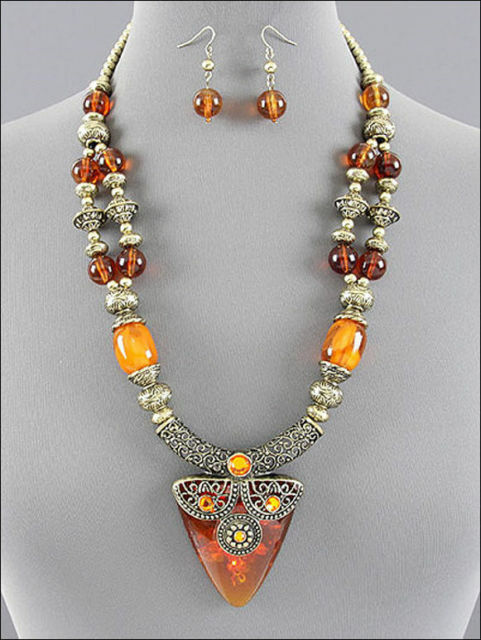 Faux amber necklace . Freyja’s prize possession is her magnificent necklace Brisingamen, which was forged by dwarves and imbued with all sorts of magical powers. It’s described as being made of fine gold filigree with amber, so you’ll want to wear something pretty elaborate. The piece we suggest has the right look. 2012 Costume Contest Winner: Abby Kluska won our very first costume contest wearing our Freyja design! She did a beautiful job with it, and we love the special touches she added to make it her own. Abby went the longline bra route, and tells us that she used a few coats of Rust-Oleum Aged Copper for the base plus Rust-Oleum Hammered Gold for accents. Looks great! Illustration credits: The central image in our main illustration is by Jen Delyth, and depicts Yggdrasil, the cosmic World Tree in Norse mythology. The four rectangular images are all details from larger paintings. 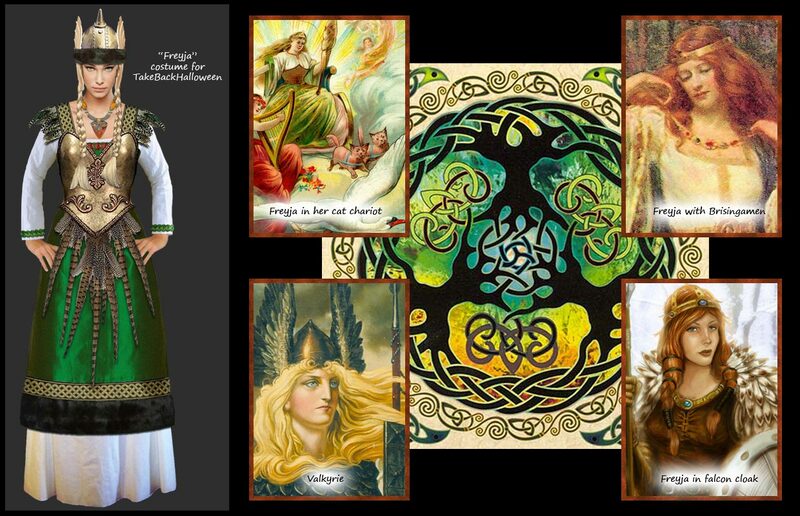 Clockwise from top left: 1) detail from a vintage Liebig Company trading card titled Freya, Göttin der Liebe; 2) detail from Freyja and the Necklace (1890) by James Doyle Penrose; 3) detail from the Freyja card in the game Age of Mythology; 4) detail from Valkyrie (1971) by Konstantin Vasiliev.